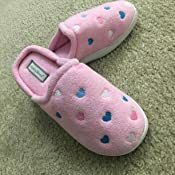 #ad KushyShoo Women’s Terry Embroidered Cozy House Clog Slippers are $12.59 at Amazon.com. If you act quickly, before 9:10 am (EST) you’ll pay only $10.70). Easily cleanable by hand or machine washing with like colors in cold water, followed by line drying. Do not iron or dry clean. Orders $25.00 or more ship FREE.